Copenhagen-based multi-disciplinary design agency OEO Studio have completed their redesign of lighting giant FLOS’s illuminating Scandinavia showroom. 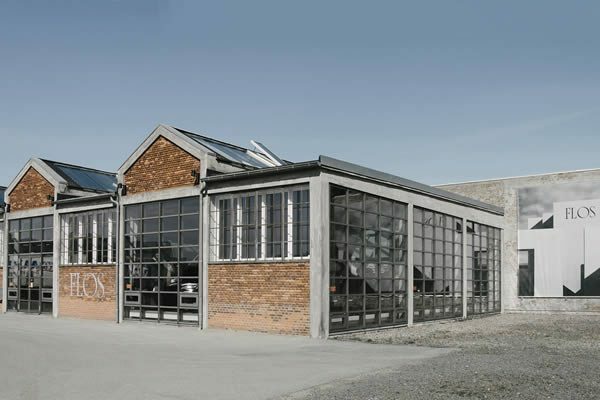 The 500 m2 space, located in Copenhagen’s industrial neighbourhood of Sydhavnen, occupies a handsome former tractor repair workshop; a detail that designers OEO Studio kept in mind when seeking inspiration for the project. Alongside its modern history and monolithic architecture, contrasts of materials, and interplay of natural and artificial light also play their part in a showroom that is anything but conventional. With a brief to ‘create a showroom of international standing; to create a natural integration of work spaces into the overall space, as well as to design a comprehensive display system that works for FLOS architectural, home and outdoor lighting’, OEO Studio have come up trumps with a space where products and a spatial experience take centre stage. Design features include a sculptural staircase that doubles up as a display unit and zone divider; ‘Cover House’, a farm shed-shaped home lighting display area clad with brick from Danish brickwork manufacturer Petersen Tegl, which nods to the building’s former life; and several abstract shelving and display units that break convention throughout.